I found a vintage atlas at the thrift store! Gorgeous, old, with a great patina! So I pulled out Tennessee and framed it up. 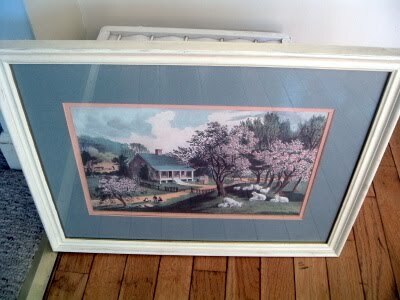 I painted the frame and the mat. 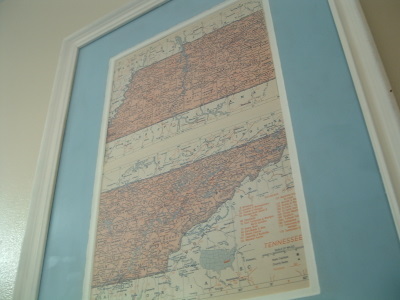 Then framed up the two pages that contained Tennessee. Great art…very cheap! I will be listing the remaining pages of the atlas in my etsy shop. So if you wanna frame some maps also, check em out while they last! Posted to Decorating Party on It’s a Blog Party. Oh, I love maps. They would be perfect in Ammon’s room. I just looked at your email. I’ll put your button on and sent mine to you later today. Thanks Angie. Have a great week. You know, today, it paid to be home sick! I would not have seen this post till tomorrow otherwise! I bought the maps! Sorry ya’ll, I’ve been looking for some for ages!!! Thanks so much for listing them on your etsy store!!! Looking forward to getting them!! HI there – Oh no – I’m too late…! 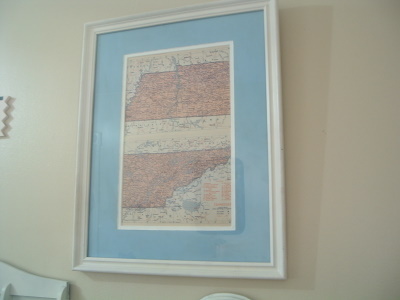 I have been looking for a cool vintage map to frame for my house…love this post!! Your map looks great. No problem Angie, I was just curious. I grew up in Ca, and of course, I am a bit sentimental about it. Thanks! That’s a great idea! I find frames ALL the time while I’m thrifting. Also, we have maps that we don’t use. I think it’s be cool to try and age them a little with some strong tea. I might have to give that a try. Thanks for stopping by my blog. Love yours and am now following. Oh wow!!! What a gorgeous idea! My husband and I have lived all across the country during our lives…what a great way to celebrate life! I’m going to keep my eyes open at thrift stores too! Cute idea! And aren’t you clever to share the others in your etsy shop! Have a great weekend. I love framed maps. We’ve got one big display of them in our family room that are all from a very old Civil War book. It would be fun to do a second display of maps of areas that we love to visit. Thanks for the inspiration! What a great idea. Framed maps are so cool looking. So pretty!!! Love it so much. Thanks for sharing the link. Lovely blog, hope to see you at My Dream Canvas!